In this 25 hour program you will be provided with the knowledge and skills necessary to teach 60, 75 and 90 minute Hot Yoga Classes. 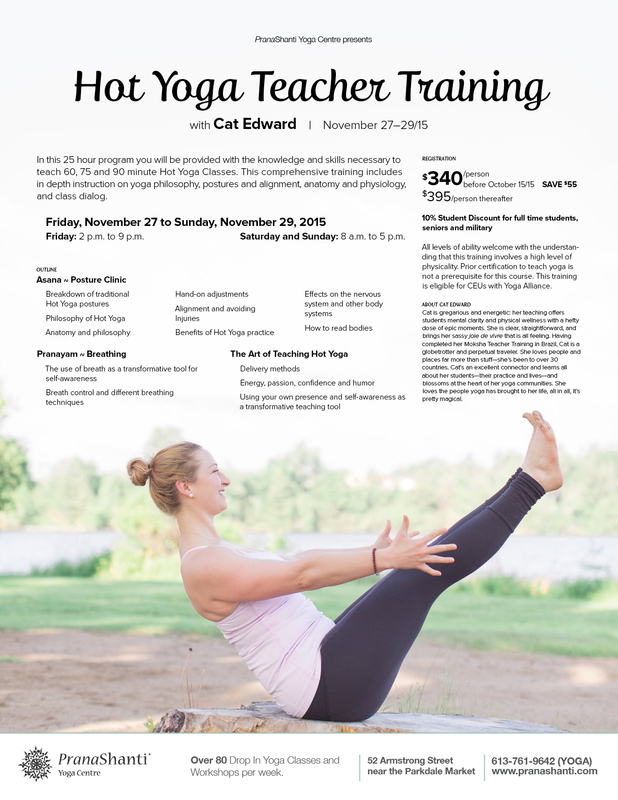 This comprehensive training includes in depth instruction on yoga philosophy, postures and alignment, anatomy and physiology, and class dialogue. Please check in with us for 2016 dates. Cat Edward is gregarious and energetic: her teaching offers students mental clarity and physical wellness with a hefty dose of epic moments. She is clear, straightforward, and brings her sassy joie de vivre that is all feeling. Having completed her Moksha Teacher Training in Brazil, Cat is a globetrotter and perpetual traveler. She loves people and places far more than stuff – she’s been to over 30 countries. $395.00 per person. SAVE $55.00 by registering on or before October 15th, 2015 for $340.00 per person. Note: Please bring your own mat, towel, water bottle, electrolytes, and any other snacks and food you may need during lunch and break time. We will sweat a lot! You may also want to bring a change of clothes, towels and shower items. Hot Yoga is practiced in a room heated between 95˚F to 105˚F. All lectures and posture clinics will be held in a regular temperature room. Only class sessions will be held in the heat. All levels of ability welcome with the understanding that this training involves a high level of physicality. It is beneficial for the student to be comfortable with a hot yoga practice. Prior certification to teach yoga is not a prerequisite for this course. For 200 hour certified Yoga Teachers the credits for this training can be applied towards a 500 hour certification and is eligible for CEUs with Yoga Alliance. Refunds (minus a $300 Administration Fee) are available up to 5 days before the starting date. No refunds or credits will be provided after the course has started. 10% Student Discount for full time students, seniors and military. Minimum Registration is 10 students, maximum registration is 25 students.